As never before, obesity is becoming the biggest and most actual problem in our daily life. To have excess weight does not simply mean to have excess fats.To have excess fats in your body means creating danger for your health! 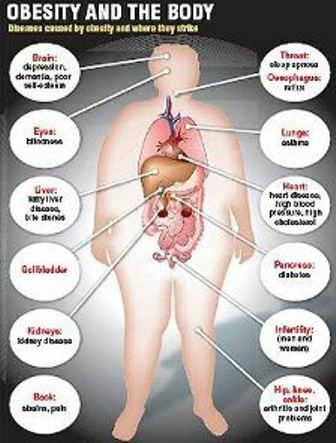 These health risks clearly show us how important it is to lose excess weight even if you fell well at present. It is very difficult to change one's lifestyle - the habits of nutrition and exercising. You will be able to do this only if you will make a plan for yourself. In order to consider yourself obese, your body weight should exceed your normal body weight by 20 %. Normally, your body should have a weight that is considered normal for people of your height and bone structure. From here, arises the absolute necessity to control your body weight and keep it normal. All excess fats should be removed from the body. This is the next question.